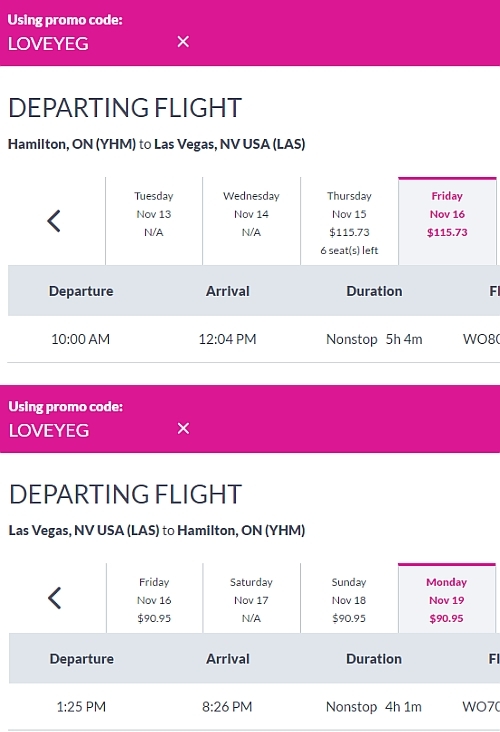 Swoop, which is WestJet's new ultra low cost airline, has just announced new flights from Hamilton to Las Vegas, Orlando, Tampa, and Fort Lauderdale, Florida, starting at $234 CAD roundtrip. Keep in mind that $234 roundtrip is the base price, and includes *only* a personal item. Low cost carriers charge extra for *everything*. $294 CAD roundtrip is the more realistic price to compare against other options. 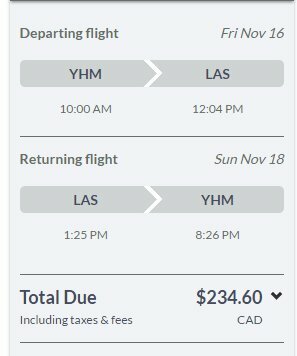 Weekend flights (Friday to Sunday) are currently available at this price for Hamilton to Las Vegas. - look for the dates that are $119 on the way there, and $116 on the way home. 2. Search for a one way flight from Hamilton (YHM) to Las Vegas, Orlando, Tampa, or Fort Lauderdale. 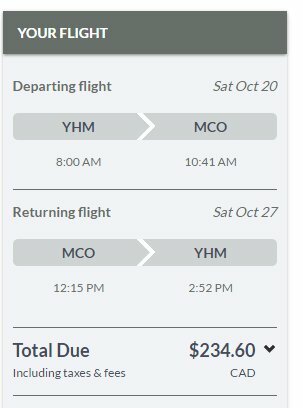 The one way flight should be $115 to $120 CAD. 4. Now look for a one way flight from the U.S. city to Hamilton (YHM), and use the promo code again. 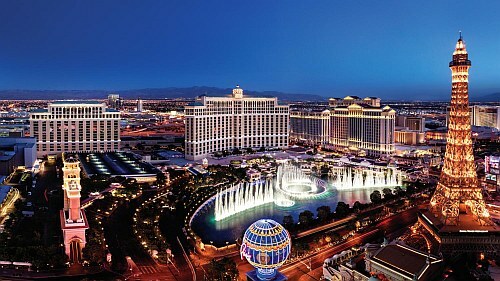 One Response to "Hamilton to Las Vegas, Orlando, Tampa, or Fort Lauderdale, Florida - $234 to $294 CAD roundtrip | non-stop flights"
This worked for me. The promo code worked like a charm and I was able to book my parents flight to Ft. Lauderdale.